In 2007, Urban China - primarily an architecture magazine published from Beijing, but essentially an attempt to chart China's progress toward modernization at breakneck speed - was invited to participate at the Kassel Documenta 12. It responded to the call of this somewhat quirky and extremely avant-garde show of contemporary art and design, held every five years in Germany, by trying to figure out the answers to three questions lobbed at it. These were highly philosophical questions raised by the Documenta, which did not elicit answers that could be spontaneous or absolute. 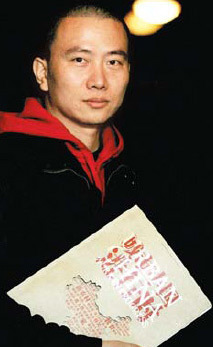 But editor Jiang Jun and his crack team of writers brainstormed and arrived at certain responses. Urban China:Work in Progress is co -edited by Jiang Jun(above) and Brendan McGetrick. The answer to "Is modernity our antiquity?" lay in China's socialistic new village which, Jiang points out, had its roots "in the stratocratic government of the 1900s", even though the process seemed to have started in the wake of the "cultural revolution" (1966-76). The question "What is bare life?" led to the answer: the Chinese family - "the basic unit for moral practices and cultural reproduction". After considerable picking of brains over "What is to be done?" the strands of thought converged on "education" - "the most important goal of China's modernization reform". The Urban China team dedicated three issues of the magazine to the themes of new village, family and education, trying to contextualize the humungous body of material they had already accumulated around these subjects, for a book on Chinese cities tentatively called High China. Now, two years later, a selection of articles from these three issues of the magazine have gone into an ingeniously-designed and incredibly-informative book, Urban China: Work in Progress, co-edited by Jiang Jun and Brendan McGetrick. For the sheer range of subjects it covers - from the impact of Confucian ideas on the Chinese tradition of family education to the nitty-gritty of the hukou (household registration) system and how it constrained mixed marriages in the late 1980s - this book is a collector's item. But that, however, is less than half the story. Urban China: Work in Progress is a marriage of form and content. It's a work that sets out to achieve the clock-defying task of capturing moments in the history of a culture that's morphing and rebuilding itself at an incredibly accelerated speed. While it could be quite exasperating trying to keep pace with China's fast-track urbanization in the magazine format, trying to put it in a book might seem like a pointless exercise. Li Bingbing poses with her best leading actress award for "The Message" at the 46th Golden Horse Awards in Banciao. Rihanna performs at an outdoor concert in New York's Times Square during an appearance on ABC's Good Morning America. Check out the top stars whose films make a lucrative hit at the box office. Jake Gyllenhaal and Reese Witherspoon are still going strong, a rep for Jake told Access Hollywood on Sunday. Veteran of the stage and screen Julie Andrews is set to return to the London stage for a one off show in May. Rihanna and her father both spoke to the press about their most recent estrangement.